Powered by an available new turbocharged 2.4-litre SUBARU BOXER engine for outstanding levels of performance and efficiency. Redesigned Outback features world-class safety, including standard EyeSight driver assist system and available DriverFocus Distraction Mitigation System. Available vertically mounted 11.6-inch touchscreen infotainment system. On sale this fall, the 2020 Outback will offer SUBARU STARLINK Connected Services for enhanced convenience and peace of mind. 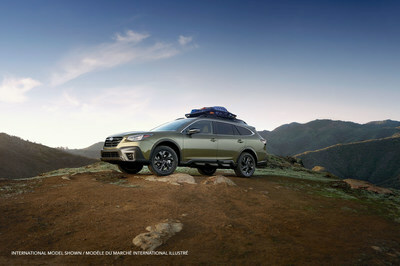 MISSISSAUGA, ON, April 17, 2019 /CNW/ - Nearly a quarter century after its debut, Subaru Canada, Inc. (SCI) is pleased to introduce the safest, most capable Outback ever built. 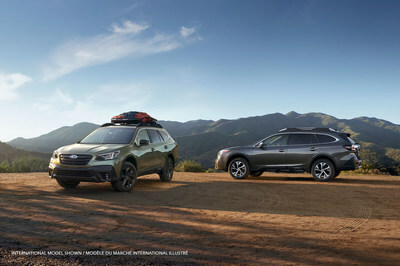 Unveiled at the New York International Auto Show (NYIAS), the next-generation 2020 Outback features Subaru hallmarks, including Symmetrical full-time all-wheel drive and EyeSight driver-assist system, both standard, as well as new technologies that promise to elevate the Outback to new heights. Building on Subaru's "Dynamic x Solid" philosophy, designers of the sixth-generation Outback incorporated an "Active x Tough" concept that expresses both athleticism and strength. With pronounced wheel arches, highlighted by wheel arch mouldings that improve both form and function, and lower cladding reminiscent of a hiking boot, the Outback looks ready for adventure from any angle. Beyond its rugged design elements, the 2020 Outback also features a sporty look thanks to a dynamic silhouette and fenders that have been pushed out further to emphasize a strong, planted stance. And, of course, the Outback offers an impressive 220 millimetres of ground clearance — a staple of Subaru's utility lineup — for outstanding go-anywhere ability. Inside, the Outback's cabin offers upmarket appeal through high-quality design and materials. 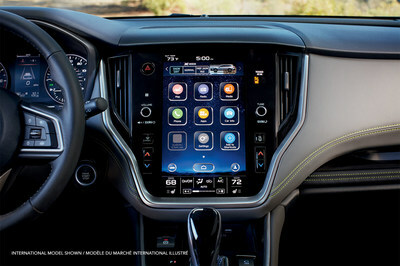 Front and centre is the available tablet-style vertically mounted 11.6-inch touchscreen infotainment system, which more closely mirrors the form and function of a smartphone or tablet, while a variety of upholstery choices will be offered. Elsewhere inside, outstanding outward visibility adds to an already spacious cabin, with expanded dimensions compared to the outgoing model. Adding to the sense of openness is a cabin design that expands outward from the prominent centre stack, with contrasting materials used throughout the lineup. The functionality of the cargo area has also been enhanced thanks to the new Outback's Subaru Global Platform (SGP) underpinnings, along with its extended overall length. Through the integration of Subaru's scalable vehicle architecture, the width between the wheel housings has been expanded, as has the opening width of the rear cargo area. 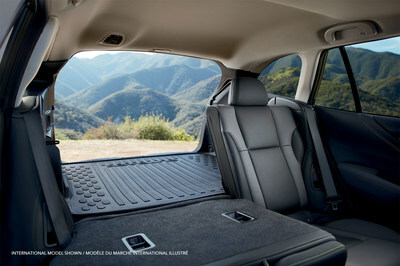 Accessing the cargo area is easier than ever thanks to an available hands-free power tailgate — the first time such a feature has been offered on a Subaru. The hands-free function works by simply waving in front of the Subaru emblem located on the rear gate, while a one-touch retractable cargo cover, another Subaru first, further improves the functionality of the cargo area. Contributing to reduced noise, vibration and harshness (NVH) is new sound-insulated glass, which uses a sound-insulating inner film for the windshield and front-door glass, while glass thickness all around has been increased for class-leading quietness. The Outback's suspension has also been reworked to provide improved ride and handling performance. Introduced for the 2017 model year, the Subaru Global Platform (SGP) has been optimized for the 2020 Outback. In fact, the vehicle's structure is 70 per cent stiffer in both torsional- and front-suspension rigidity, and 100 per cent stiffer in both front lateral flexural- and rear subframe rigidity compared to the previous model's platform. Contributing to those impressive increases include a 13 per cent jump in the use of ultra-high tensile-strength steel, a whopping 371 per cent increase in the use of structural adhesive compared to the first iteration of the Subaru Global Platform, and, in a Subaru-first, a floor cross-member filled with a highly rigid and lightweight and two-part foam material. All of that contributes to a new body that absorbs over 40 per cent more energy in front/side crashes than the outgoing model. Powering the 2020 Outback is the choice of two engines, both designed to meet the needs of Canadian drivers. The first, a new 2.5-litre SUBARU BOXER, features nearly 90 per cent new parts, as well as direct injection and auto stop/start, and increased output and efficiency. The new engine produces 182 horsepower and 176 lb.-ft. of torque and comes mated to a Lineartronic continuously variable transmission (CVT) with paddle shifters and a new eight-speed manual mode. The combination results in quicker acceleration and improved efficiency. An exciting new addition to the 2020 Outback is the available turbocharged 2.4-litre SUBARU BOXER that produces 260 horsepower and 277 lb.-ft. of torque. Mated to a high-torque Lineartronic CVT, turbocharged Outback models benefit from a broad torque curve, with peak torque achieved from 2,000 rpm through 4,800 rpm. When equipped with the turbocharged engine, the next-generation Outback is capable of towing 1,590 kg (3,500 lbs.). The 2020 Outback continues the model's tradition of offering a smooth and comfortable ride while also being capable of handling off-road conditions with ease. In addition to the standard Symmetrical full-time all-wheel drive, a hallmark of Subaru's vehicles, the Outback also features standard active torque vectoring, first introduced on the WRX and WRX STI performance models, for improved handling and cornering performance. The new Outback is adept at handling off-pavement adventures, and includes standard X-Mode to tackle a variety of weather and road conditions. When engaged, X-Mode optimizes the engine, transmission, all-wheel drive system and brakes for optimal traction on slippery surfaces and steep inclines. New for 2020 is an available dual-function version of X-Mode that offers Snow/Dirt and Deep Snow/Mud modes for even more capability to go virtually wherever necessary. Whether heading off-road or negotiating parking lots and laneways, the 2020 Outback also boasts an available front-view camera that offers a 180-degree view of what lies ahead. Following its successful introduction with the 2019 Forester, the new Outback also benefits from the availability of Subaru's innovative DriverFocus Distraction Mitigation System that is designed to help address distracted driving and driver fatigue. The segment-exclusive system, which uses facial recognition software to identify signs of driver fatigue or driver distraction, works alongside Subaru's EyeSight driver assist suite to reduce the likelihood of a collision. Utilizing a camera mounted atop the dash, DriverFocus can register and recognize as many as five drivers and remember their individual pre-sets for seat position and door mirror angle, among others. Subaru's EyeSight safety suite, which includes features like adaptive cruise control, lane departure and sway warning, lane-keep assist, lead vehicle start alert and more, will be standard equipment on the 2020 Outback for increased safety and peace of mind. New for the 2020 Outback is the enhancement of the EyeSight suite to include Advanced Adaptive Cruise Control — a new lane-centring function integrated into the car's adaptive cruise control system. While drivers must maintain control of the vehicle at all times and keep their hands on the steering wheel, this new functionality uses the EyeSight system's stereoscopic cameras to recognize lane markings and the preceding vehicle to stay centred within the vehicle's lane of travel. Placing a further emphasis on safety and convenience is the introduction of SUBARU STARLINK Connected Services. Using the nationwide 4G LTE cellular network — and completely separate from customers' mobile devices — SUBARU STARLINK allows customers to stay connected to their vehicles while also allowing them to receive important information to keep them safe. Integrated directly into the vehicle, the system uses voice-response technology with the addition of live assistance for features such as Advanced Automatic Collision Notification in the event of a collision, SOS Emergency Assistance, Enhanced Roadside Assistance and Concierge Service. Customers utilizing these services will be able to receive automatic emergency assistance in the event of a collision, remotely access vehicle features, schedule service appointments with dealers and receive point of interest navigation information among much more. Other features include remote services, such as remote engine start (including climate control and heated seats), remote lock and unlock, and remote vehicle locator, as well as vehicle alerts such as speed, boundary or curfew alerts that can all be controlled directly from customers' smart devices. Set to go on sale this fall, the 2020 Outback will be on display at NYIAS from April 19-28. Pricing will be announced at a later date. Subaru Canada, Inc. is a wholly owned subsidiary of Subaru Corporation of Japan. Headquartered in Mississauga, Ont., the company markets and distributes Subaru vehicles, parts and accessories through a network of 94 authorized dealers across Canada. For more information, please visit www.subaru.ca or www.pr.subaru.ca or follow @SubaruCanada on Twitter.